How to share or transfer a Moovly project with/to other Moovly users? You can easily share your project with other Moovly users so they can view, copy or edit that project. 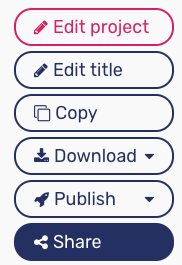 Then give that user a certain right: you can allow him or her to view, copy or edit the project you're about to share. The Edit right will allow the other user to directly edit your project and save these edits. This can be intended in collaboration projects, but also cause unintended results, such as loss of content when two users edit a Moov simultaneously. Make sure to synchronize well with the other user and avoid to open or work on the same Moov at the same time. Sharing takes the subscriptions into account of both the user who shares and the user the project is shared with. Sharing is possible between users who have the same subscription, but when trying to share with a user of a higher or lower subscription, certain rights may not be available (e.g. when features or libraries are used which are not available in one of the subscriptions). If your project is finished and you'd like to publicly share the finished video with your audience for viewing, then you can publish your video and share it from there on your favorite social networks. What's in the Free Trial? How can I embed a Moovly video?